AncestorPuzzles.com: Do You Want to Be a Genealogy TV Star? Do You Want to Be a Genealogy TV Star? 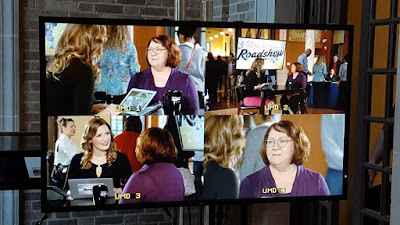 The two worlds of reality TV and genealogy collided in Houston yesterday at the filming of the PBS Genealogy Roadshow. 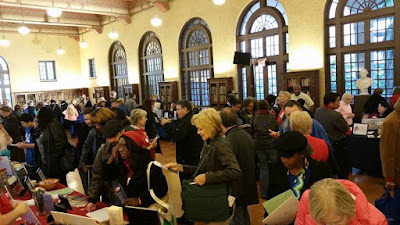 I was there yesterday in the Exhibit Hall in the Julia Ideson Building of the Houston Public Library representing AncestorPuzzles.com, the Bay Area Genealogical Society and the Association of Professional Genealogists. Nick Cimino representing AncestorPuzzles.com and APG in the Exhibit Hall for the Genealogy Roadshow. Helen Mooty and her husband, John Dickey were being filmed for her upcoming appearance on the show. The Bay Area Genealogical Society (BAGS) was well represented at the Genealogy Roadshow with a cadre of members volunteering throughout the Exhibit Hall. First and foremost was BAGS member, Helen Mooty who will be featured in the Houston episode of the PBS Genealogy Roadshow. Helen Mooty will learn about her family history in the 2016 season of Genealogy Roadshow. Genealogist Mary Tedesco is seen here with Helen revealing the results of the family research. Helen Mooty described the entire Genealogy Roadshow experience as thoroughly enjoyable. The Roadshow staff was very professional, on-time, and friendly. The production team spent a half day scouting locations for the episode and another entire day filming Helen before the event on November 22. 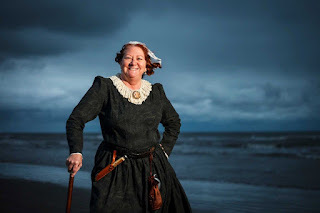 They filmed Helen portraying Jane Long, “Mother of Texas.” Helen and John took four members of the production team on a Galveston Bay sailboat trip to give the television viewers the authentic Gulf Coast experience. Helen Mooty portraying Jane Long, "Mother of Texas"
BAGS had an information table in the exhibit hall. Thanks to all of the BAGS members who worked the table from setup at 8 AM until closing at 6 PM. In addition to our own table, BAGS members worked at tables provided by Clayton Library Friends, Daughters of the American Revolution and several other genealogy and lineage societies. Mary Tedesco visited the AncestorPuzzles.com table yesterday at the Genealogy Roadshow. Mary is a member of the Association of Professional Genealogists. Debbie Parker Wayne and Nick Cimino, fellow APG members, listen attentively as Mary explains some of the inner workings of the Genealogy Roadshow. List the resources you have already consulted (for example, 1850 census Washington Co., TX, Civil War pension file, land & probate records, etc.) AND what you found in each. of the Houston Public Library at the Houston Genealogy Roadshow. Your next opportunity to become a star of the Genealogy Roadshow is in Albuquerque, New Mexico at the Old Airport Terminal – Saturday December 12th (9am – 6 pm). The show is also planning to film another Roadshow event in January 2016 in Los Angeles. Go here and fill out the casting application. Good Luck! Famous Kin: John D. Rockefeller, Jr.
Is My Brickwall About to Tumble Down?